Lifting up your car with a bad floor jack can be really dangerous and can result in serious injuries or even death as you may know already. A lot of accidents is caused because of faulty liftings of the car with a floor jack and the lifting height is not great enough and you put different spacers or other tools to make it lift your vehicle higher. To lift a truck or SUV in a secure and fast way you may need a larger floor jack with high quality that can hold the weight of the truck. In this post, You will find the floor jacks with the highest usability and high quality, perfect to lift your truck several years ahead. 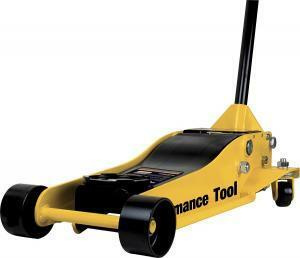 All these floor jacks are tested at car repair workshops by professional technicians. A high-quality floor jack does not have to be very expensive. We have listed the best floor jacks for trucks & SUV’s to buy for both home and commercial usage. 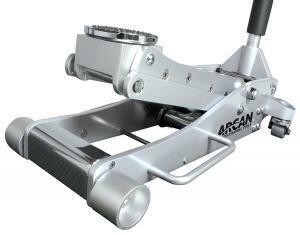 On the first place on our list, you will find a floor jack made by the known brand Arcan. 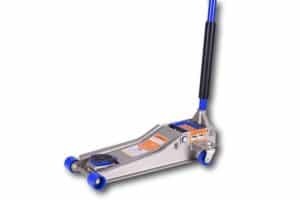 The Arcan ALJ3T is a high-quality light-weight aluminium floor jack which has the most functions that you need and it does really scream quality. The aluminium material makes it pretty light-weight and it has the most functions and safety functions needed to make a safe job under your vehicle. The lift capacity is 3 tons and it has a lift range of 3.6″ to 19.4″. If you have a very low or a lifted vehicle, you have to check to make sure it will fit your vehicle. Why we are choosing this floor jack as number one, is because of the overall functions, quality, safety and all these combined with the great price for the floor jack. The floor jack choice for an overall daily use, working for the most kind of vehicles. The floor jack for you who are looking for a high-quality floor jack that will do the job for you several years ahead. The Sunez 6602LP is the floor jack you look at have if you are looking for a floor jack for really high lifts. It is perfect for lifted trucks & SUV’s which require a really high lift capacity and high maximum lift. It has an impressive lift range of min 2.75″ to a maximum of 24″. The lift capacity is 2 ton and it’s mostly because of the high lifting arm. If you have a very heavy truck, you should consider this and make sure that you will not exceed the lift capacity, because it may result in injuries if you are not careful. The long lift-arm is perfect to reach everywhere under your vehicle also. Lift range from min 2.75″ to max 24″. Long-Throw to reach any lift points under your vehicle. A perfect high-quality floor jack for lifted trucks and SUV’s that require a high lifting range for a reasonable price. On the third place on the list, you will find the Performance Tool W1627. What’s great with this one is that you can choose between a lot of different models after your needs. There will be an option for all needs and you do not have to look further. This review is made for the 3-1/2 ton Performance tool Floor jack. You can choose between both low profile and high lifting jacks for and lift capacity for your needs. This floor jack has a whole 3-1/2 ton(7000lbs) lift capacity and will be enough for the most vehicles on the market. It is equipped with the most required functions like a double pump for fast lifting, 360 degrees wheels for easy movement and a over-load protection for the safety. Check out this floor jack if you want a lot of options to get a customized floor jack after your needs. This floor jack is a bit different from the other floor jacks on this list. It has a patented triple lift and fit for both motorcycles and the most kind of vehicles. It has a built-in “jack stand” for easy and safe lifts. The price is reasonable for all the functions this floor jack delivers. 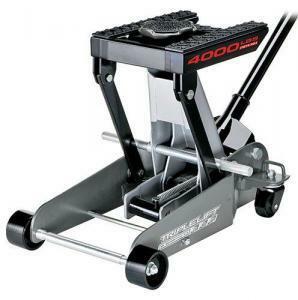 It does not have a very high lift capacity and may not fit under lowered cars, so make sure it will fit your vehicle and your car is not too heavy for this floor jack. The minimum lifting range is 8-5/8″ and may be too high for some vehicles. The lift capacity is 2 tons and it has a max height of 18-5/8″. If you are interested in this floor jack, check the video down below where they are explaining the functions. A good floor jack for a good price if you are looking for a multi-purpose floor jack with a combined jack stand built into it. If you are looking for a pretty cheap floor jack that will work well for both lifted trucks and lowered vehicles, the Liftmaster should be your choice. It’s a low profile steel jack with a mid-lift range. The price a reasonable if you are looking for a floor jack for a garage and home usage. It has a really low min lift height of 3 inches and will fit under the most lowered cars also. The max lift height is 19.7″, which may not be enough if you have a lifted truck. If you have a lifted truck, I do recommend to check a one with a higher lift. Also, this one has a 360 degrees wheel movement for easy mobility. 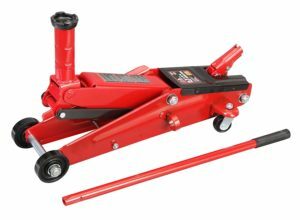 A floor jack for those who are looking for a floor jack that can lift both lowered and lifted vehicles for a reasonable price for a garage usage. The Torin Big Red Floor jack is a budget floor jack for those that are not using the floor jack for a daily use and are looking for a cheaper alternative. The floor jack is also really small sized, which may be prefered by a lot of people if they do not have a good amount of space in their garage or shred. The price is really reasonable for this floor jack. It will come with a distance to higher the lift range for uses with trucks and SUV’s. The lift range is minimum 6 inch and a maximum of 21 inches, which will do the job for the most lifted trucks. The lift capacity is the impressive, 3 ton for such a small floor jack. The rear wheels have a 360 degrees turn-ability for easy movements. How do I choose a floor jack for my use? To choose the best floor jack for your need, you have to consider the price, quality, lift height, lift capacity and the lowest lift point (If you have a low car). You should always check the specification of your car and see how much it weight to make sure you won’t exceed the lift capacity of the floor jack. Then you have to think of how much will you use the floor jack. If you have a workshop and are going to do 100 lifts per day, you might want to get a real high-quality floor jack. But in my opinion, you should always choose a high-quality floor jack, because you really don’t want your car to fall down on you when you are working with your car. Always use jack stands as a compliment when you are going to do any work under your car. If you have a lifted truck, make sure the lift height will be enough. Can you lift heavier than the specified lift capacity? 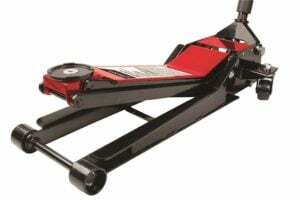 If you have a new floor jack in good condition, it can probably lift more than the specified lift capacity. The manufacturers have to make safe marginals to avoid any unnecessary accidents. But I do not recommend to exceed the lift capacity, because you really don’t want your car to fall on you when you are working under it. Do I need jack stands or is a floor jack enough? You should always use jack stands when you are working under your car, even if you have a really high-quality floor jack. All floor jacks can get a problem or an internal leak and make the car fall down on your, and you won’t stand a chance against a 2-ton car, so always make sure that you have at least 2 jack stands under your car which has the right capacity for it. It’s stupid to risk your life for these tasks. How do I lift my car with a floor jack? To lift your car with a floor jack, you do most often just close the pressure valve (Normally turn the handle) and pump it up with the handle. To lower your floor jack, you should turn the pressure valve the other way. See the manual of the floor jack of how to use it properly. Always put jack stands under your car before going under it. Here you will see a video of how to lift your car properly and safely without taking any risks. Where is the best place to lift my truck with my floor jack? You should always check your Service / Owner manual to find the lift spots on your vehicle. Lift your vehicle on the not supposed lift points, can result in serious damages to your body and engine. If you have a car with a frame, you should always lift on it and not on the body. Lifting on the body can result in the frame will fall down if the body is rusty. Is a cheaper floor jack as good as a more expensive one? No, when it comes to floor jacks you will often get what you pay for. The cheaper one has often a higher lowest point and can’t lift as fast as an expensive one. The cheaper one does also have a much shorter lifetime and it may cause serious damages to you and your car. I have a jack that doesn’t reach up, can I use pads to lift it higher? You can if you are very careful and have some experience. Using pads can make your car to tip off and fall down if you are not careful. I do recommend to get a proper floor jack instead of taking the risk of serious injuries to you. For some floor jacks, there are special higher-lift pads that are secure, check amazon if you can find any pads for your floor jack. If you have any experience with these floor jacks and want to leave your review about them, comment down below. If you have any other car questions you are welcome to ask them at our homepage. Supertech Oil Review - Who Makes it & How Good is it?